Finally, products formulated especially for men! 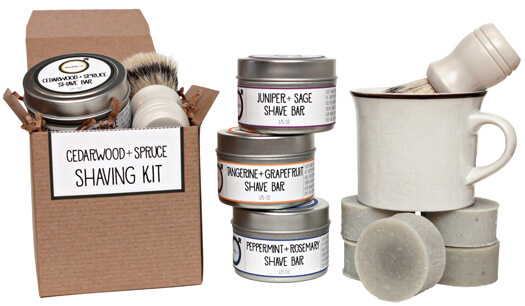 Our Daddy-O shave bars are 100% natural and will put your shaving cream to the test! Just like all of our soaps, Daddy-O soaps are all natural and hand-crafted. Daddy-O soaps come 2 in 1 with half lathering + half exfoliating. Adventure Awaits Shave Mug $8.50 Out of stock - Check back soon! Birdland Shave Mug $8.50 Out of stock - Check back soon! Empire Shave Mug $8.50 Out of stock - Check back soon! Hill & Dale Shave Mug $8.50 Out of stock - Check back soon! Retreat Shave Mug $8.50 Out of stock - Check back soon! Secret Garden Shave Mug $8.50 Out of stock - Check back soon! Shave Brush with Stand $24.00 Out of stock - Check back soon!